Bacardi Cotton Bar Towel (pp). 100% cotton bar towel just like they have down the pub! UK: 2nd class free. Plus you get 12 x Guinness Plywood Original Beer Mats. 1x Guinness thick Rubber Bar Runner 50cm x 16cm. However should you have a problem just get in touch and we will resolve any issues. This excludes glassware. GUINNESS BAR RUNNER. USED BUT REMAINS IN GOOD CONDITION WITH LOTS OF LIFE LEFT IN IT. Towel is one sided, writing and emblem woven into the fabric. Questa tovaglietta è una edizione limitata del gruppo Carlsberg E pubblicizza i suoi marchi che sono: grimbergen, kronenbourg 1664, Carlsberg, Tuborg e birrificio Angelo Poretti. Splendido tovaglietta da bar in cotone della famosa birra CARLSBERG. RED STRIPE LAGER BAR RUNNER. USED BUT REMAINS IN GOOD CONDITION WITH LOTS OF LIFE LEFT IN IT. My contain, minor fraying, minor marks and general usage wear. See Photo's for further condition report. 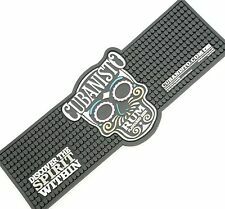 Great for movie geeks, Film Vampire Horror bar mat. • machine washable. CARLING BAR RUNNER. PLENTY OF LIFE LEFT THOUGH! WHYTE & MACKAY WHISKY BAR RUNNER. PLENTY OF LIFE LEFT THOUGH! DESPERADOS THICK RUBBER BAR RUNNER x1. NEW AND UNUSED. Our LUFC bar runners are ideal for multiple purposes and venues. Personalise with your bar or pub name or add that extra personalised touch to a special occasion for that number one Leeds fan. The bar runners can also double as a multi-media mat, perfect for the office, reception desk or any table top – add a bit of LUFC to any setting! Made from non-slip rubber nitrile base topped with polyester surface with border and machine washable at 30 degrees. Absorbent to soak up spillages and ensure slip free bar surfaces whilst visually improving counter tops. They are 50cm x 22cm and approximately 1.5mm thick. This bar runner will keep the bottom of the glass always dry. 2 pieces Rubber Bar Runner ( 1 piece 60x8cm 1 piece 15x30cm). - Made from Thermoplastic rubber. - Material：PVC Rubber. - Note: No cutting, No Firing, clean with neutral detergent. 1 UNUSED BAR TOWEL. OR FOR THE COLLECTOR. • Digital colour printing. ALL OTHER WORDS ON THE ITEM WILL BE PRINTED AS STANDARD. • machine washable. Budweiser FA cup. Official beer to the Emirates FA cup.